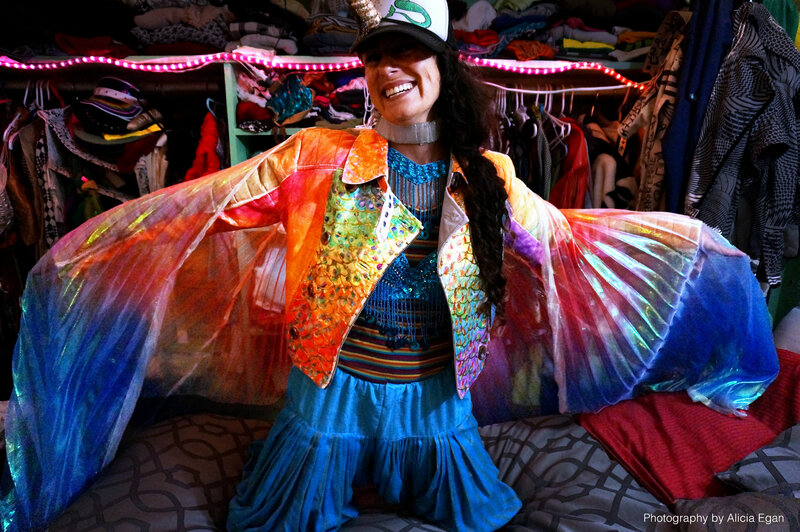 ­­­­In San Francisco, a city whose residents call in sick on Halloween more than any other city in the country, Bass Cabaret meets with a multi-faceted performance artist and professional costumier: Sarah Stylisms. From the moment you pass through Stylisms’ front entryway, your senses are engaged with both scent and style and you are enveloped in an environment that can only be home to the creative. 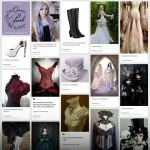 From floor to ceiling, every inch of her space is dedicated to costuming. To the untrained eye, one cannot differentiate between Stylisms’ “money-making” attire and her day-to-day wear. Surrounded by a fog of incense, one can distinguish the aroma of a mélange of baking cauliflower, bacon, and kale, to be paired with lamb garnished with almonds. Sarah Stylisms is no stranger to indulging in over-the-top attire and the finer tastes in life. Like a tour on MTV cribs, Stylisms leads us to her bedroom which she fondly calls the “mermaid grotto”, because of the bluish decoration and ambiance. She opens drawers of shoes tucked in rows underneath her bed and switches on a string of lights for ambiance. Stylisms regularly gets commissioned to do costume design and recently styled clothing for her second music video. A child at heart, she enjoys spending time working children’s shows, and finds herself doing regular collaborations with B2B costume giant, Spirit Halloween. Used by monoliths such as Target, Hot Topic, and Walmart, Sarah has styled, designed, and modeled for this business-to-business magazine that is used as a buyer’s guide for some of the most well-known stores. Stylisms has claims to fame like designing the “Sexecutioner” Halloween outfit as well as many more. Sarah can largely say that this catalog serves as a portfolio for much of her work. When the curtain closes, Sarah Stylisms is undaunted. She reminds us that she is immortalized in lenticular print that is in circulation in haunted houses around box stores around the country. “You could totally buy me at Target for like $12.99 or something,” says Stylisms. So if you can’t catch her at a show, you can swoop her likeness up at a Halloween store near you. Bass Cabaret: What are you parents like? Sarah Stylisms: My parents? I don’t know, what are they like? My mom is a disco child in denial. She’s too young to be a hippy; she’s the daughter of a couple beatnik artists that settled in Sante Fe. She met my dad in Los Angeles in 1979 when she was here visiting her dad, and my dad came in ’77 from Jordan. So I’m a first generation Arab-American, and on my mom’s side I’m a Blue Blood American, so I like to call myself a Blue Blood Bedouin. Bass Cabaret: How do you decide what to wear everyday? Sarah Stylisms: I always go by need. Like today, all my need is for today is to be comfortable. This weekend I was a fairy princess, a rainbow fairy, a rainbow unicorn, and another rainbow unicorn, and a princess on Sunday. So sometimes on Mondays, I can’t wear any clothes. Or if I’m wearing clothes it has to be something where it’s only cotton or silk, or there’s no seams. There’s nothing tight, nothing’s rubbing on me. You have to give yourself a break after wearing so much drag. Bass Cabaret: What’s a day-in-the-life like for you? Sarah Stylisms: Usually it’s building any new costumes I need, I also do custom costume commissions for other performers. I just did a bubble costume for (Elliot from Vau de Vire), something for him to contort in. I’ve got kind of a special angle on the costuming — as a performer too, who has seen a lot of other kinds of acts, I know what other performers need in their costumes. I know what it takes to drive in a costume, to put on a costume in the car, to put it on in a closet, to put it on in the dark, to have somebody else put it on you while you’re blindfolded… all of the things that could happen. Bass Cabaret: How long do you spend on costuming? Sarah Stylisms: How long I spend on costuming varies ’cause sometimes I make a costume, sometimes I just style a costume – pull together things I already have or just shop and alter. Sometimes I build from scratch. Prep time for me for a weekend of gigs can be anywhere from one to four hours if I don’t have to build a costume. 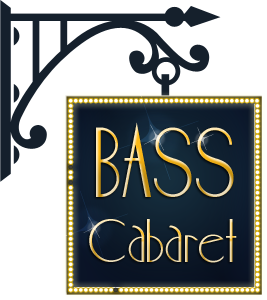 Bass Cabaret: What is your favorite character to play? Sarah Stylisms: Definitely a rainbow unicorn. Bass Cabaret: What will you be wearing for our November 22nd show? Sarah Stylisms: If I weren’t going to be a stage hand, then I would be a mermaid because then I could be the patron saint of pearls, but you can’t really walk as a mermaid. So unless I’m posted up for a photo booth covered in pearls, then I will probably be the Cheshire Cat! Bass Cabaret: What have you been up to since you performed at our maiden show? What were your first impressions from our first event and subsequent events you attended? Sarah Stylisms: The next event I attended was French Kiss, the naughty French one, and the venue (Broadway Studios) was so old that when the bass hit, debris fell from the ceiling backstage between the artist entry and the stage! Pretty much all I did was wear a French maid costume and sweep up the dirt so the barefoot acrobats wouldn’t have to walk through the grit that just fell from the ceiling before entering the stage to perform. The one amazing thing I did was to warn Belle Phénomène, who had just spent tons of time and money on this gorgeous Marie Antoinette dress, that Dottie Lux was about to exit the stage covered in red paint, and shove her into a closet and close the door!